Trump’s policies will only make it worse. The number of people employed in the renewable energy sector worldwide reached a record 10.3 million last year, according to a new report from the International Renewable Energy Agency, an organization that supports countries transitioning to sustainable energy. The addition of half a million new renewable energy jobs was a 5.3 percent increase from 2016. 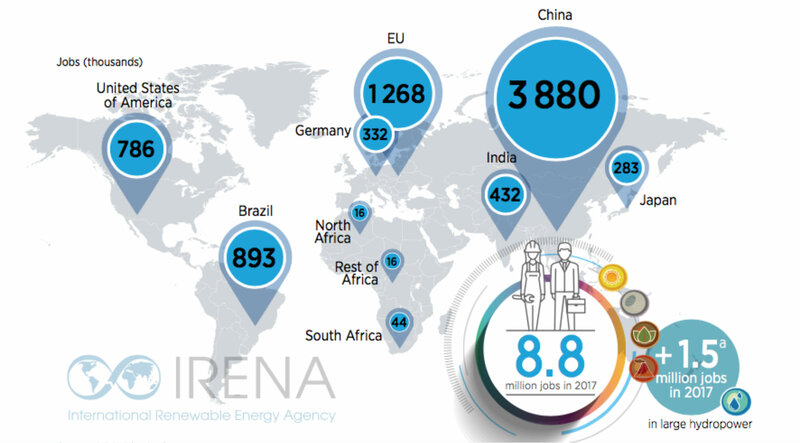 As in previous years, China, Brazil, the United States, India, Japan, and Germany took the lead in renewable energy employment. But the new figures reveal a continued shift toward Asian countries, particularly China, which alone accounted for 43 percent of all renewable energy jobs in 2017. Note: Jobs in large hydropower are not included in the country totals except for data for the EU and Germany. The solar photovoltaic sector was the largest employer in the renewable energy industry last year, employing 3.4 million people globally.